This week I’ve been thinking about how my day to day look has changed since leaving our old life in suburbia behind. It soon led me to working out that I had worn a business suit, a nicely starched and pressed white shirt and a tie regularly, at least 5 if not 6 days a week, for almost 32 years. Back then I didn’t really give it a second thought, as it became second nature, you know, it’s what was expected of me, working out in the corporate world. Oh, how things have changed. From those days when I was so keen on a nice sharp crease down my trouser legs and always turned out with a whiskerless chin, to be blunt, I have turned into a right dosser. I seem to have gone from smelling of any number of your average, mid range aftershaves, to smelling of a variety of farmyard fragrances. Although my look probably changed very quickly and I have mentioned it before, I really didn’t appreciate just how far down hill it had actually gone. That was until this week when I had to pop into our local supermarket in Pocklington for some bits n’ bobs. So picture the scene, I was standing in the middle of the cereal aisle, but without causing a blockage and inhibiting the flow of trolley pushing happy shoppers, when not one but two shoppers happened to glance me up and down. At that moment I did consider whether I should ask the obvious question as to their sudden interest in my attire and being a redhead, it did take a fair amount of self control to not make some sarcastic inappropriate remark, but I’m pleased to say, I resisted the urge. I was a little narked though as it had really put me off deciding which cereal to plump for and I’m always rubbish at choosing at the best of times. I eventually made my choice, no surprise, cornflakes again, and then hurriedly got myself through the self checkout. It was only then, as I walked out of the store past all the full size, nicely polished, plate glass windows, that I could see for myself what a complete tramp I looked. My black woolly hat pulled down over my eyebrows, a smelly coat with far too many holes, my burgundy jeans slouching much too far down my rear and wellies which could have done with a good clean a month ago. I did feel comfy though! Anyway, we’ve had some unexpected progress around here this week. It came in the shape of Morag, our youngest Highland cow. I was out in the field grooming Monica, her mother and just as I finished pampering her, Morag came up alongside us for a nosey. 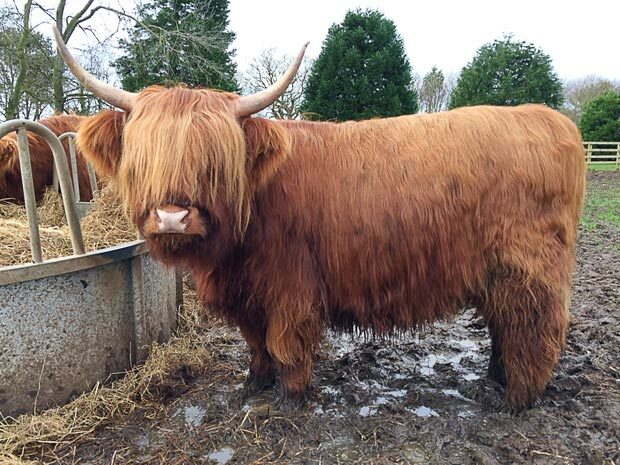 As I had finished grooming her mother, I reached out to try and give Morag a quick comb and it would be a quick one, because as I’ve said before I always have to get her penned up before grooming, as she hates that comb. For some reason though, things were different today. I know that I had to chase her around the field several times like something off the Benny Hill show, just snatching a sly comb here and there, but whatever her concerns had been with that comb, all of a sudden they disappeared. I think it had eventually dawned on her that this grooming lark felt good. All of a sudden, she stopped and stayed rooted to the spot until I had combed her from head to toe and my goodness did she look good!